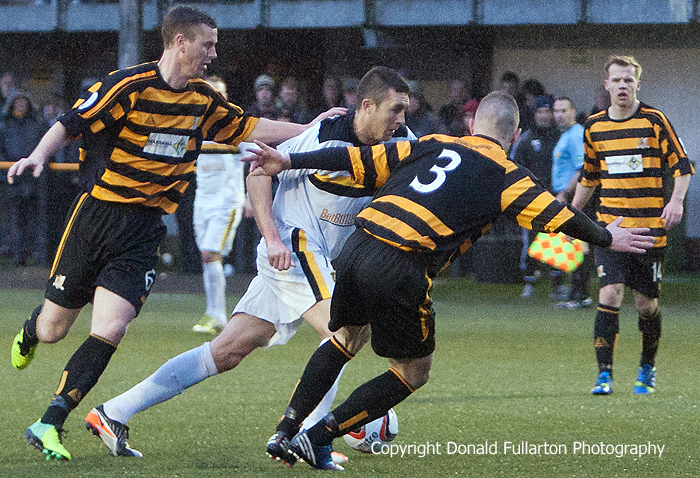 DUMBARTON reached the quarter-finals of the William Hill Scottish Cup with a workmanlike victory over Alloa Athletic at dimly lit Recreation Park. A crowd of 749 — including two busloads of Sons fans and many who travelled by car — saw Ian Murray's men reach the last eight for the first time since 1979, and earn a trip to Pittodrie in March to face cup favourites Aberdeen. The visitors dominated a match which never hit the heights, and survived a few scares towards the end as new manager Barry Smith's side tried to find an equaliser to Colin Smith's first half goal. That goal was the highlight of the afternoon. Paul McGinn raced up the wing, crossed deep to Scott Agnew who controlled the ball with his back to goal and then sent a looping ball to the far post when Nish blasted home from close range. Before the break Sons had a chance to double their lead in an incident which almost a carbon copy of the league match in January. On loan striker Chris Kane raced into the box, was pulled down by the keeper who received a yellow card, and prepared to take the spot kick. The only difference was that this time the keeper saved. In the rapidly fading light the second half saw both sides playing long balls forward, lots of effort, several substitutes, but little in the way of fluid attacks. Sons best effort was a Scott Linton shot from 20 yards, which cannoned back off the crossbar. The picture shows goal hero Colin Nish breaking into the box.